“We are all here united and larger in number than the representatives in the UN who voted for the two state solution to divide Israel. While they represent different countries we represent the Lubavitcher Rebbe, the one and only leader of our generation who vehemently opposed such a scheme. 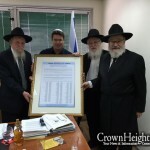 Therefore we hereby declare in the name of all the Shluchim that the UN Resolution is null and void and there never, ever will be a Palestinian state alongside Israel and every inch of Eretz Yisroel will remain under control of its rightful owner – Am Yisroel,” declared Rabbi Yoseph Gerlitzky, head shaliach to Tel Aviv to a resounding applause by 4, 325 Chabad emissaries from around the globe. 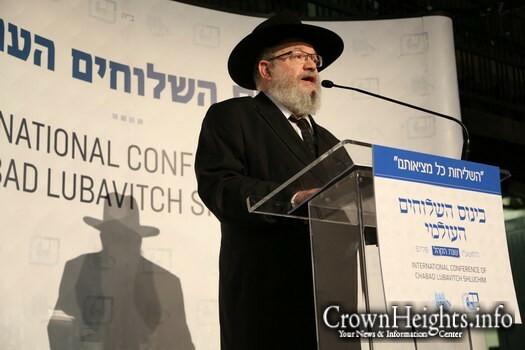 Gerlitzky, who is also the Chairman of the Rabbinical Congress for Peace, was addressing the annual Chabad Lubavitch International Shluchim Conference in Brooklyn, N.Y., the largest rabbinical convention in the world, this weekend. He accused the UN and all those who support the false hope of a two state solution for the violence in Israel which affects both sides. Every time A Palestinian teenager runs with a knife to stab an Israeli and gets shot, the death of this Palestinian is a result of the false hope of a two state solution. He quoted the ruling in the Jewish Code of Law Orach Chaim Chapter 329 that forbids handing over land under Israeli control to foreigners for it can serve as a springboard to overrun the whole country. “From time to time, he said, we meet with experts on the Middle East, professors and senior military officials to discuss with them the security situation. They always tell us that the reason an Arab gets up in the morning and decides to stab Jews or spends millions of dollars to buy missiles is because they feel that the entire world believes that they deserve a state of their own and Israel must provide them with more territory for this. Hence, they feel that more terror and stabbings will pressure and precipitate Israel to give more and more. In the words of military officials: “Every Israeli declaration that under certain conditions we will be prepared to concede – this in itself is a tailwind to terror. It has nothing to do with the Temple Mount. It has nothing to do with their economic situation and has nothing to with what you hear in the media in Israel or outside Israel. It is has to do with one thing only and that is – the Israeli leadership vacillates, they do not believe and are not confident themselves that Jews are the rightful owners of all of Eretz Yisroel and therefore the Arabs exploit this weakness as an opportunity to pressure more and squeeze out incessant concessions. There is only one solution, said Rabbi Gerlitzky, “the moment it will be clear in no uncertain terms that the Palestinians will never have a state of their own under any conditions and Israel will never give up an inch of its land – the pressure will cease. 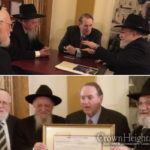 Rabbi Gerlitzky recalled a meeting he and a group of rabbis had with former US Ambassador to Israel, Mr. Martyn Indyk who identified with the Peace Now ideology. After telling him what Jewish Law states he yelled at us: “You people need to have your minds switched” and nearly chased us out of his office. The Rabbinical Congress for Peace was founded in 1993 in order to alert public attention to the clear position of the Torah concerning territories under Israeli rule. This Halachic ruling is anchored in the supreme value in Jewish Law known as “the sanctity of life.” Saving a life supersedes the entire Torah. Because of this value, the Torah unequivocally forbids relinquishing even one inch of territory under Jewish rule or participating in any negotiations concerning withdrawal from any such territory. I thought Chabad doesn’t mix into politics? Chabad is nonpartisan. That doesn’t mean it doesn’t take stands on issues before the public. The Rebbe would scream is heart out one farbrengen against the Camp David accords and how the government in Israel was conducting the Lebanon War and more. Once someone asked him why does he mix in politics and he replied Pikuach Nefesh is not politics but is a din in Shulchan Oruch which supersedes everything even the suspicion that it is politics. Since when is Life and death “politics”? Both Camp David and Oslo were agreements never meant to be kept, as we see they have both been violated many times. For example in 1974, Egypt faked peace talks to lull Israel into thinking they really want peace. During the peace discussions, Egypt began the Yom Kippur war. Israel was caught off guard and suffered terrible casualties. There is no advantage Israel gets from either of the agreements.